Availability: Optional Roofing & Stains/Solutions Choices! Foot Print: 7" x 8"
Lots of folks want to know the best modeling Tips & Tricks ... Sometimes, a brick is the perfect tool! (SEE above images) ... Yes, you are reading this correctly and if you haven't looked at the image to the right, now would be the time to do so. 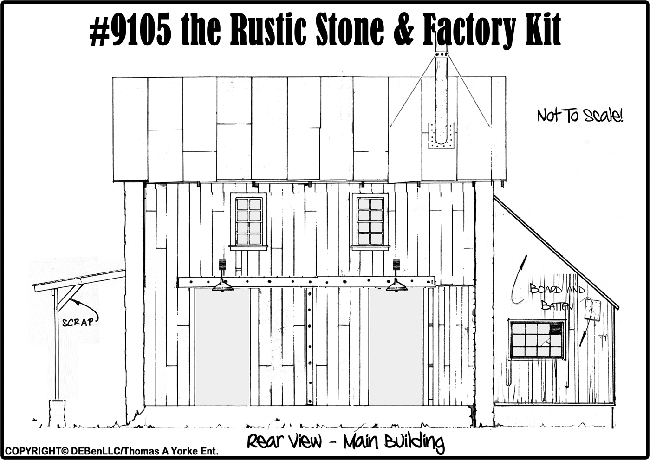 We have mentioned more than a couple of times in previous Newsletters that the "Out Building for the Rustic Stone & Frame Factory Kit #9105 would be offered as a separate structure kit. 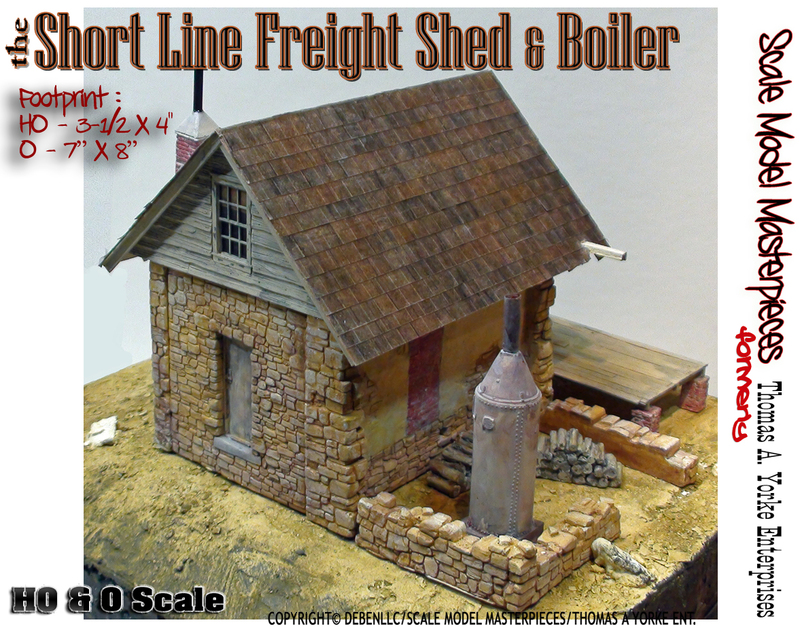 The new kit known as the" Short Line Freight Shed & Boiler" kit will be basically the same as the Out Building only with a bunch of "stuff" added. 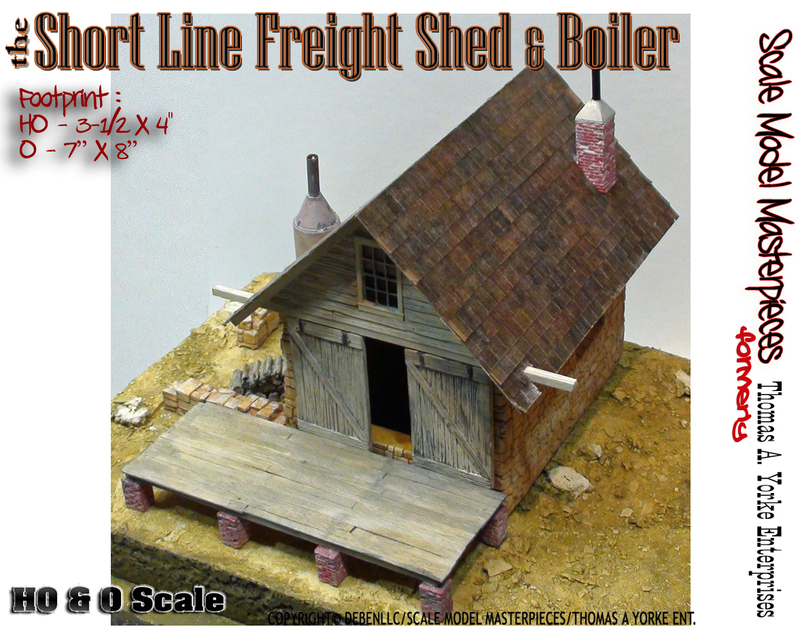 The Short Line Freight Shed & Boiler kit will also include stone remnants of what was once a boiler room as well as a free standing vertical boiler (shown in the above image) and a bunch of boxes, barrels and stacked sacks. Reservations may be purchased on our website by either clicking the above image or searching 9162 on our website. Now available, we will be posting Pilot Model build updates and Pilot Model images on the website as well as at least one Newsletter prior to the release. A side note/update of "what other stuff" is included with this kit, well everything seen in the picture as well as: (3) Boxes #9045;(3) Boxes #9050; (3) Barrels #9041; (3) Boxes #9030; & (3) Boxes #9035 which are all cast in our Labstone gypsum just like our Scale Model Masterpieces kits. We have several Options to chose or NOT chose when purchasing this kit. 1) The Option of adding Doctor Ben's Weathering Stains and/or Weathering Solutions used for the finish & weathering of the Pilot Model; and/or 2) Roof Material-Choices of either Corrugated Metal or Seamed Tarpaper (Grey or Red Oxide) are available instead of the Doctor Ben's Precision "Square City Shake Shingles (#DBZ6155) included in this kit. 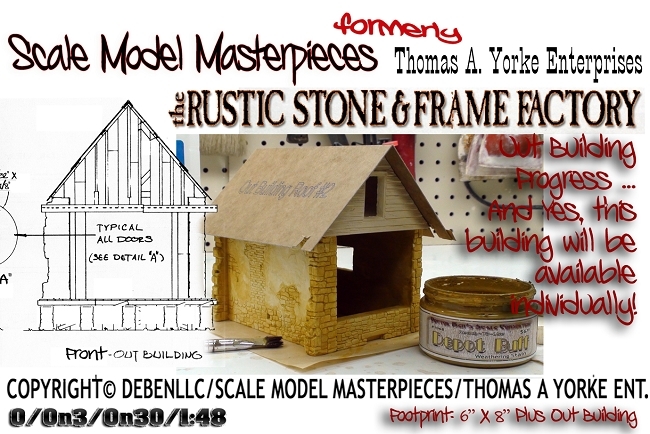 As for the Rustic Stone & Frame Factory Kit #9105 kit, it too is a "work in progress". 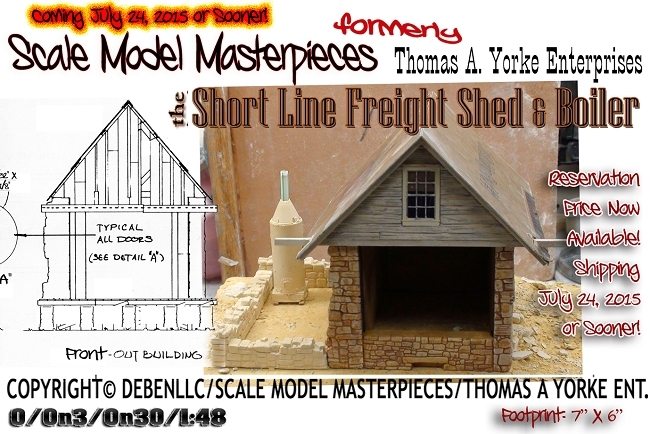 This 1978 Thomas A. Yorke Ent kit (Now Scale Model Masterpieces) is receiving a whole new (and some original) update. To date. we have the Main Building Drawings 95% complete and the Instruction Booklet updated. Just for the record, this kit is NOT four Hydrocal© walls glued together with windows & doors stuck in as a quickie kit. Folks this IS a craftsman kit with high quality LabStone/Dental Stone, bubble-free castings and lots of cutting and fitting of wood, plastic, Labstone parts and components that is going take more time than a quickie kit. However, when you have constructed one of our kits, you may be compelled to take it to a model contest, and no, you would not be the first to do so. We know of many who have already done so, so do you best! For the bunch of you who have recently purchased this kit and would like the "Updated" Instruction Booklet", simply post a message in the Comment Section of your next website order to include the updated booklet and we'll include it with your purchases. We recommend waiting a few weeks or so before making this request in that there are going to be some additional updates. 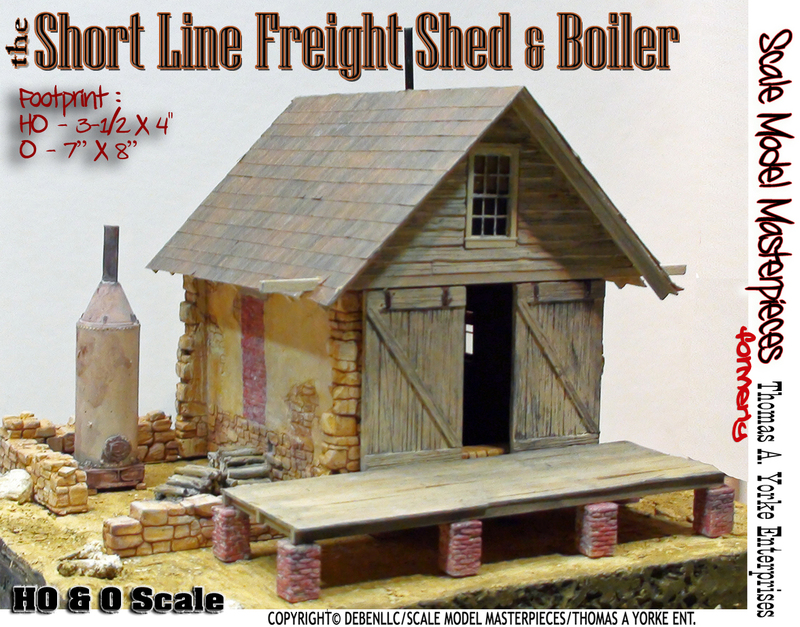 HO Scale Update: We decided to offer this same version in HO which will be available in a couple of weeks. Originally, we had created a more sophisticated version and we're shelving that design until some future time. For the record, most everything you see in the images as well as quite a bit of other stuff that you don't see as this update progresses. Folks see images and drawings f rom other kit manufacturers with details and items that they are expecting with the kit, and the long story short it doesn't and the customer is disappointed. For us it's WYSIWYG (What you see is what you get) unless duly noted in the drawings & images. Be sure to keep checking back at our website Blog for the updates—we've got some great ideas planned! NOTE: All of the casting for this model are made from "original" Thomas A. Yorke molds/masters and cast in Labstone/Dental (Buff) for much more superior detail than casting made of Hydrocal© can produce. The windows, doors, and some other details are Grandt Line product molded plastic. Doctor Ben's Roofing material is provided as well as the instruction for its application. Each kit has updated instructions are to make construction more applicable to changes of materials and modeling techniques. 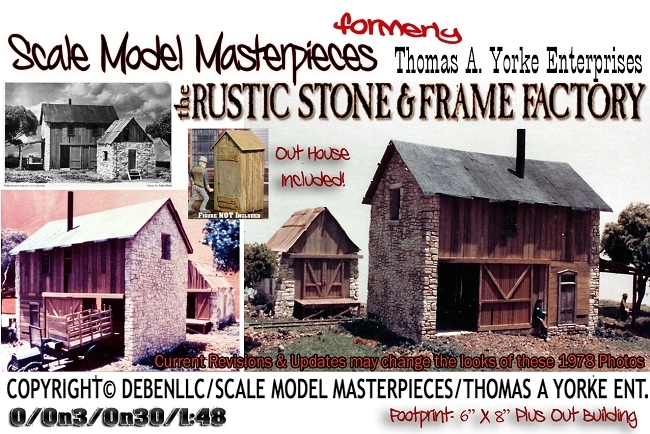 This brand new update includes detailed construction drawings (SEE adjacent THUMBNAILS), scale lumber, Precision Cut template & content sheets, barrels and boxes, outhouse/privy (pictured), weathering instructions, color photos, instruction booklet, and much more. The original 1978 #O-9105 kit was originally produced in the produced by Thomas A Yorke and although there have been some variations, this craftsman kit includes the best aspects of previous versions..
And yes, Doctor Ben's Weathering would look good on the roof. At right is the Front Elevation view of this kit. 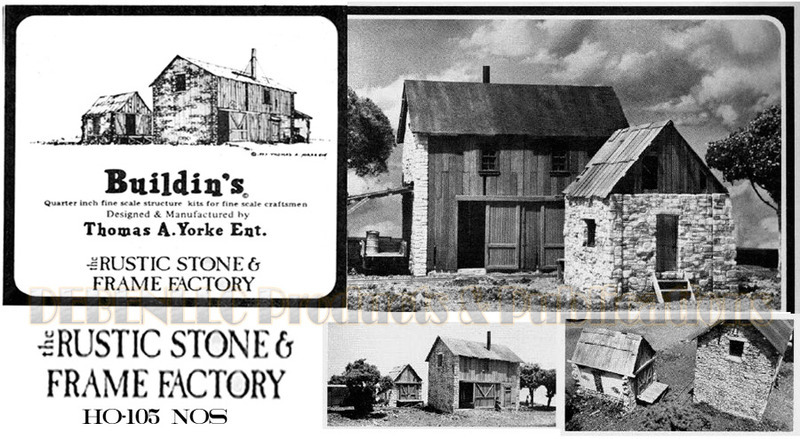 Booklet Instruction include is a color photographs!